This pop of pink in my scarf is officially my new favorite color as of now. I've already picked up four different scarves with a similar tone of pink on it..and am on the search for shoes and a bag with a similar shade. Obsessed? You know it. Oh and sorry guys I have not been very good at responding back, but I will be commenting back to all of you tonight! I invite you to see my blog and my outfit too. Stunning like how you added a pop of color. Great outfit, that sweater looks so comfy. You look stunning!! Obsessed with those jeans and loving the hot pink scarf! Great look, especially with pulling out white jeans! I'm afraid to pull mine out just yet. They look great paired with that comfy sweater. Thanks for visiting my blog! I'm following now! 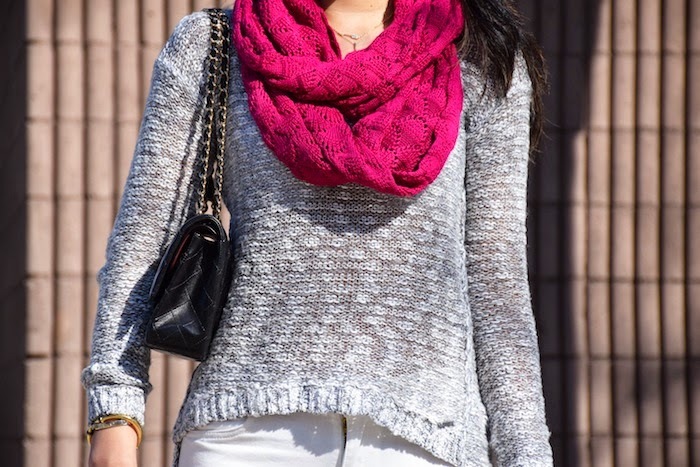 Love the texture of your sweater and scarf! So chic! Great outfit and you look so pretty! Would you like to follow each other to stay in touch? Let me know, thanks! In love with this amazing look!!!! So gorgeous! Love this look! The neutrals are great with that pop of pink! I love your shoes too! That is an awesome color of pink! It looks so great against the neutral colors. So excited for warmer weather! thats a lovely color, more pretty against the neutrals ! Hey Samantha! It is a very lovely outfit! Love the pop of pink!! you look very pretty! Thanks for visiting my blog... Would love to follow each other! Following you now on GFC and facebook...hope you can do the same... <3 <3 Keep in touch!